Govt. 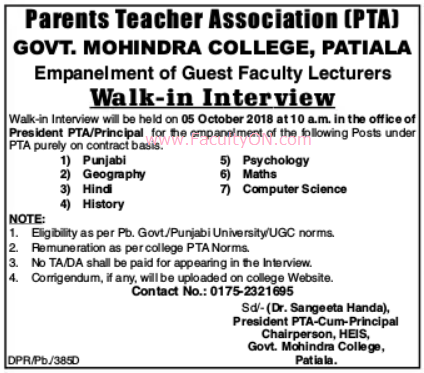 Mohindra College, Patiala has advertised in the TRIBUNE newspaper for recruitment of Guest Faculty Lecturers jobs vacancies. Interested and eligible job aspirants are requested to walk-in on 05th October 2018. Check out further more details below. About College: Established in 1875, Government Mohindra College Patiala, Punjab, is the oldest institution of contemporary higher learning in Northern India. Mohindra College was the first institution in Punjab to receive A+ grade from the National Assessment and Accreditation Council of the Government of India.